It’s the stereotypical summer scene: lounging around at the pool or beach on a beautiful, carefree day. Add a baby/toddler/kid (or two), and suddenly this seems a little less idyllic, right? As with everything, there’s a baby carrier for that! 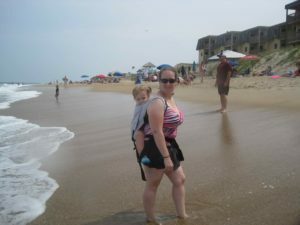 Water carriers are baby carriers that are designed for use in or near the water. Why do you need a special carrier? Because regular carriers aren’t designed for use in water, wearing them wet can put extra stress on the carrier. Water carriers are made with materials that can better hold up to salt water or pool water. Also, a regular carrier can sag or stretch when wet in ways a water carrier won’t – so it’s safer for baby to be in a water carrier if you’re going to be splashing around. Water carriers also dry faster, since they’re made of quick-drying materials and use less padding. As with all babywearing, safety is very important. All of the same considerations that you would make for dry wearing should be made for water wearing – you want to make sure baby’s airway is clear and visible, that baby is in an ergonomic position, and that you and baby are both comfortable.Also, the same as all babywearing, you don’t want to do anything while wearing that you wouldn’t do while holding baby in your arms. While water carriers are made to get wet, you don’t want to actually swim with them – wading and splash pads are perfect, but heading into deep water while wearing isn’t safe. A great rule of thumb is to stay no more than waist-deep in a pool and less deep than that in ocean waves. Remember, baby’s head will always be lower than yours so you need to be extra aware of where baby is in relation to the water. 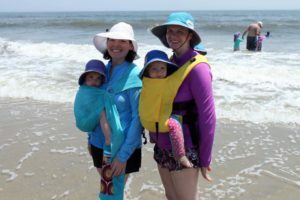 We often rely on babywearing to corral multiple kids – wear the little one so we can attend to the older one – but when it comes to water wearing, you have to be incredibly cautious. If something happens with the older child, it’s easy to lose awareness of where baby is in relation to the water and accidently dunk them. So, how do you pick a water carrier? A good place to start is with which carriers you like on dry land. Whether you prefer a wrap, ring sling, meh dai, or buckle carrier, you can find a water-friendly version. Also, then, consider what you want to use it for. Mesh ring slings are a great, fast-drying option but aren’t ideal for carrying outside of water. A buckle carrier will provide more support for a carry on land as well as in the water. In the lending library we have several to try out including the Connecta Solarweave and BityBean, which are both buckle carriers, a Water Onbuhimo by Cute Awaking, the Wrapsody Duo water wrap, and water-safe ring slings from Zanytoes and Comfy Joey. Water carriers need a little extra TLC to extend their life – salt and chemicals can be harsh on them. Once you’re done wearing, it’s best to rinse out the carrier in water and hang to dry. At the end of the season, wash according to the manufacturer’s directions before storing. Next Next post: Big Picnic Thank Yous!